If you only have one day in Memphis, that’s too bad. 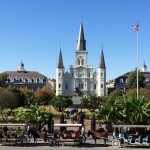 However, if that’s the case, I have the perfect way for you to spend your time in this great city. 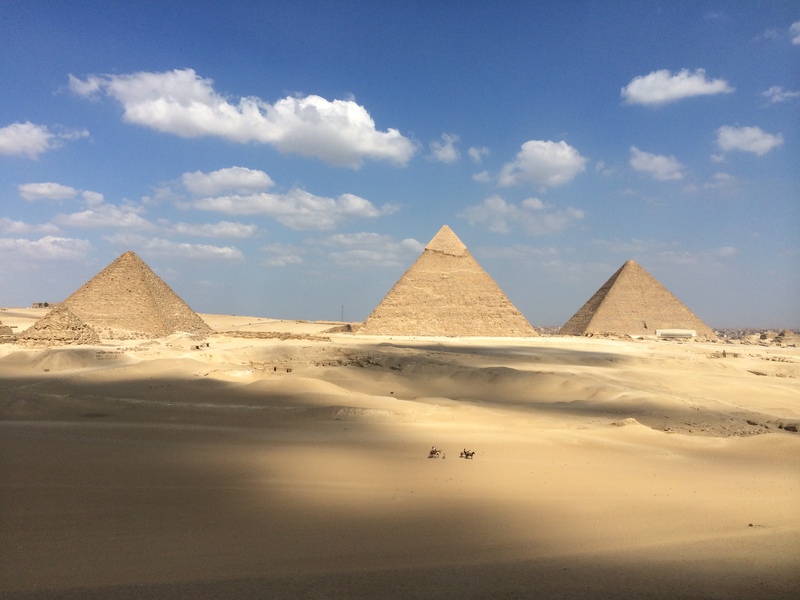 Memphis has so much to offer so budgeting your time and knowing where to go and to eat can be crucial because there are a couple can’t miss places. First, you want to stay central in Memphis so you can walk to many attractions in the city. There are a lot of hotels in the city center and around Beale Street. 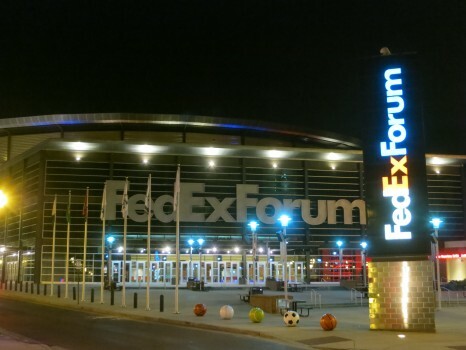 I stayed at the Westin; which was perfectly located right adjacent to Beale Street and the Fedex Forum; home to the NBA’s Memphis Grizzlies. 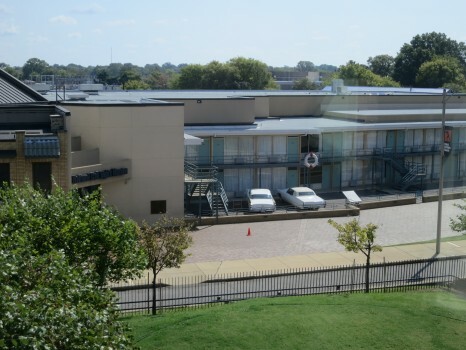 The first spot you should visit in Memphis is the National Civil Rights Museum. Now I am not a big museum guy and you rarely see me write about museums or even visit them in general but this is different. The National Civil Rights Museum is right up there with Ellis Island and the National Baseball Hall of Fame for the best museums in America. The set up of the museum is amazing and the exhibits are so poignant that it almost brings a tear to your eye at times. 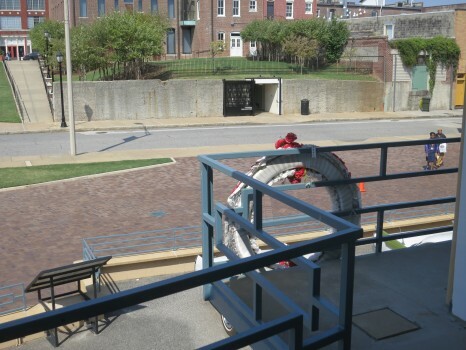 The museum is built into the Lorraine Motel. 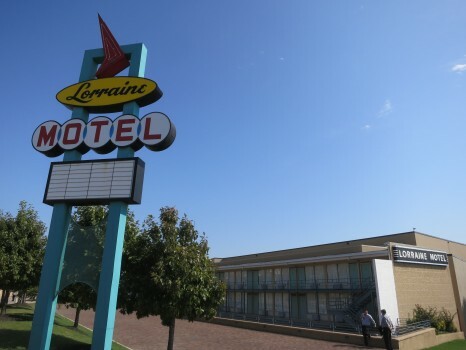 This is of course, the motel that Dr. Martin Luther King, Jr. was staying in when he was assassinated April 4th, 1968. Room 306 is clearly marked and wreathed. They do an amazing job or preserving exactly how it looked that day both inside the room and out. 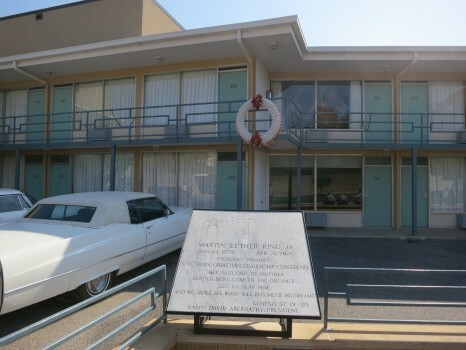 Across the street, you can visit and see the exact spot where it is believed James Earl Ray was standing when he fired the shots that took Dr. King’s life. It is a really eerie but cool thing to see. It’s like feeling modern history. Inside the museum, they show you a video about the Civil Rights Movement and Martin Luther King. They include some of his epic speeches and again, it nearly brings a tear to your eye listening and certainly makes the hairs on your neck stand up. 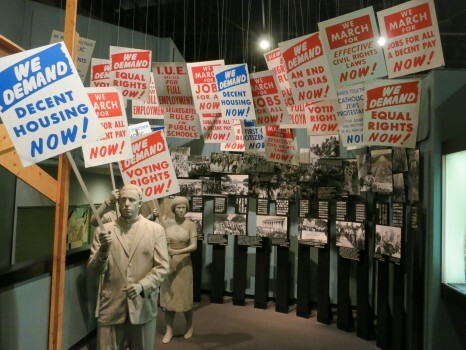 Further along are exhibits of the struggle throughout the movement. 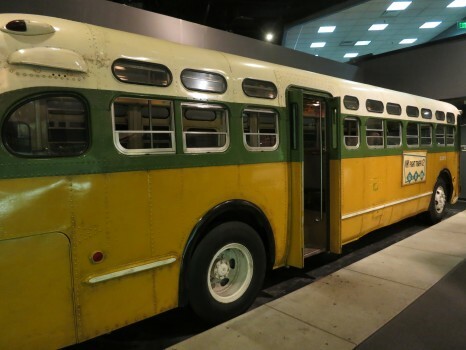 The highlight to me was an empty bus, as it would have been in Montgomery, Alabama with a statue of Rosa Parks in it. Rosa Parks is of course the woman who simply would not give up her seat on the bus for a white person. 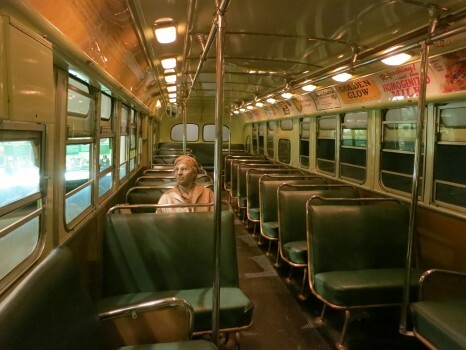 It is chilling to be in that bus alone and seeing that statue. I am getting chills down my spine typing this right now. 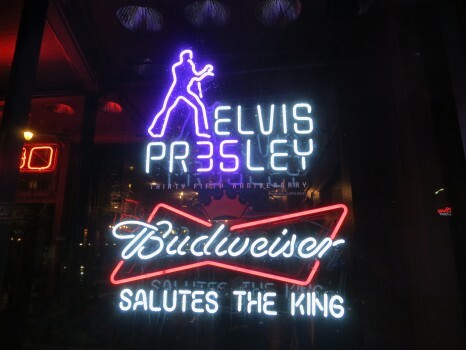 After your time at the museum, it is time for what Memphis is really known for-food! 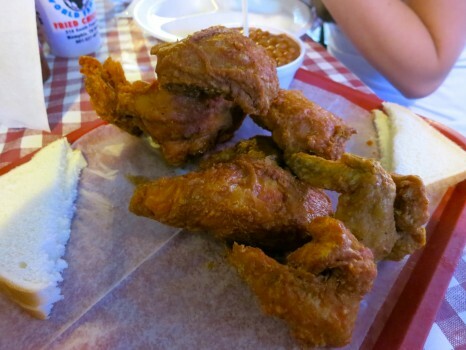 Gus’s Fried Chicken is a great place to have lunch. It is simply the best fried chicken I have ever had. It is always packed and you’ll have to wait but the turnover is quick. Just go hungry and get ready for your cholesterol to go up. Just don’t think about it and just enjoy the goodness that is Gus’s. Don’t forget to wash it down with some sweet tea, as they do in the south. Take in the décor and the ambience because they don’t make places like Gus’s up north. I can vouch for that. After sufficiently stuffing your face with chicken and beans, it’s time to head over to Graceland. 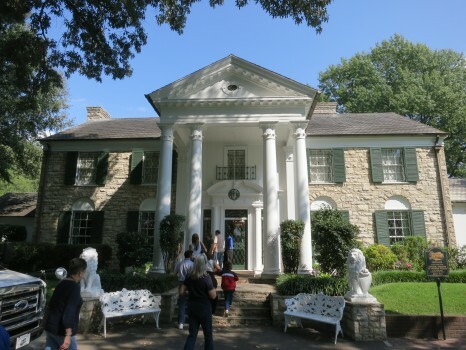 The home of Elvis Aaron Presley has been designated a National Historic Site and it is much cooler than I expected it to be. 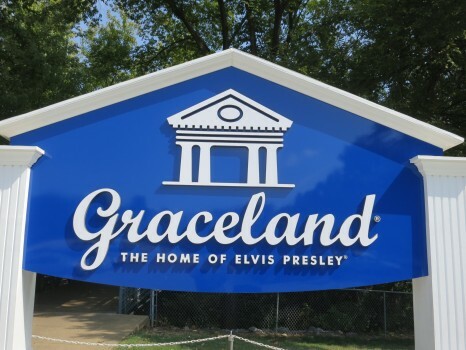 Graceland is not located in downtown Memphis. It is actually several miles out of town off the freeway and currently located on some commercial road that is home to fast food joints and other crappy stores. However, once you enter into Graceland, it’s like another world. It was good to be the King. You can tell by checking out Elvis’s personal plane, the Lisa Marie, or his cars including his famous pink Cadillac. 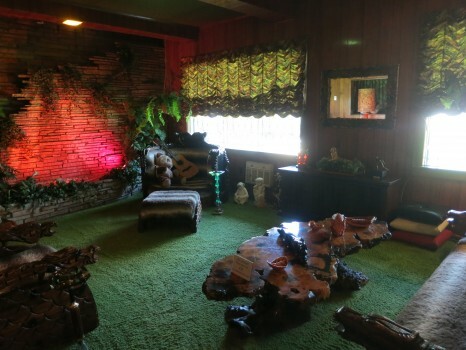 But nothing at the Graceland attraction is as awesome as his house itself. Graceland is really cool to be inside. 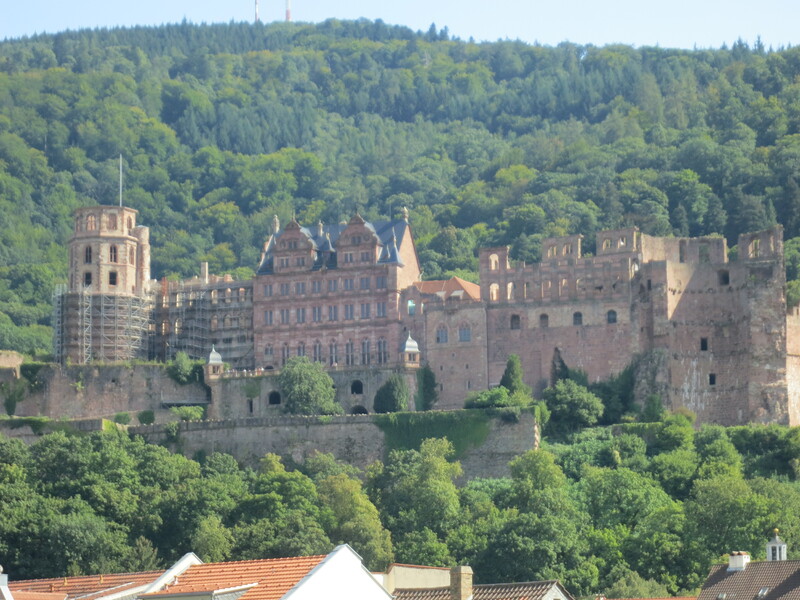 Each room is preserved exactly how it was when the King was alive and living there. The rooms are neat because they reflect the best of what the style was at the time. Of course, if you saw decorations like that these days, you’d think the people were crack heads or just the tackiest people in the world. But in context it’s amazing! 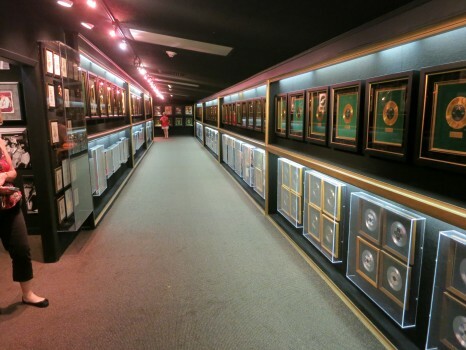 My two favorite rooms were the famous ‘Jungle Room’ and of course Elvis’s room of gold records and awards. That was seriously surreal to be inside. Reading the labels for all the awards. Even if you’re not a big Elvis fan; which I am not, you still know the songs and can appreciate what it is you’re seeing and how cool it is. 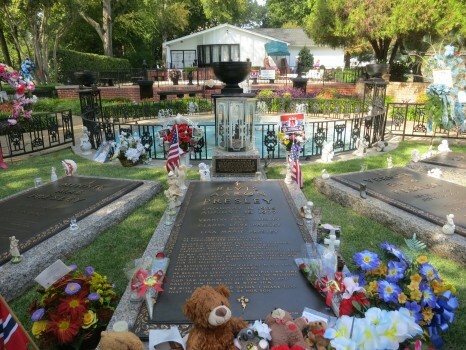 The rest of Graceland is equally interesting and the pool is where the gravesite is for Elvis and members of his family. It is a very interesting experience to be at Graceland. It was much different than I was expecting. Sure there are a lot of gift shops but the actual crux of the site and the house are really great. 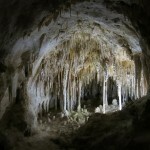 It’s worth a trip out to see. Just be wary that tickets are about $35, depending what you want to see. 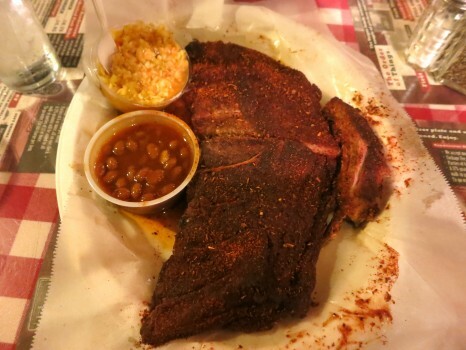 After Graceland you’ll head back to the city and you’ll be hungry for dinner and there is no better option than Barbeque in Memphis and the best Barbeque place is the Rendezvous. Located in an alleyway and as big as a football field, the multileveled Rendezvous is packed with tourists and locals alike. The walls are adorned with celebrities who have eaten there and plenty of cool southern memorabilia. But let’s get real, the barbeque is unbelievable! Order ribs and brisket and you will be in pig heaven. I wish I could include a taste on the screen for you guys reading this because it was that good. The ribs or brisket are amazing on their own and if you add a little of the Rendezvous famous sauce, they become out of this world. I can’t say enough about the place; it was phenomenal. 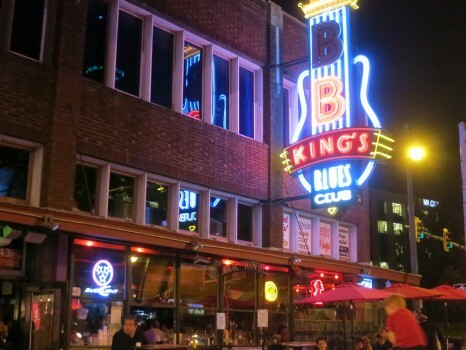 If you’re still standing after the Rendezvous, walk a few blocks back toward Beale Street; which is the famous blues street in Memphis and the center of the nightlife area. 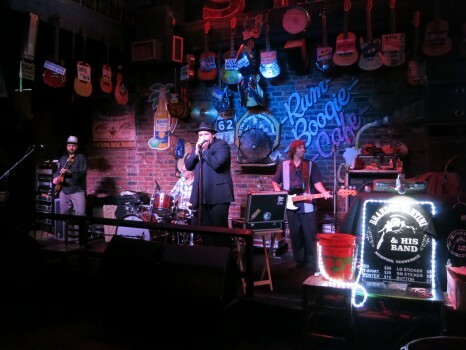 Beale Street is lively, colorful and loud but all in a good way. There are blues bars and barbeque joints up and down the street. You can listen from the street or you can go into the bar and catch some blues. What better place to start than at BB Kings! BB Kings is a great place. Memphis is the original although there are plenty of others including in Nashville and even New York City. Just grab a beer, a seat and listen to the live band blow you away with their performances. 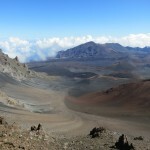 It’s an awesome place and it really makes you feel local, even though it’s obviously popular with tourists. 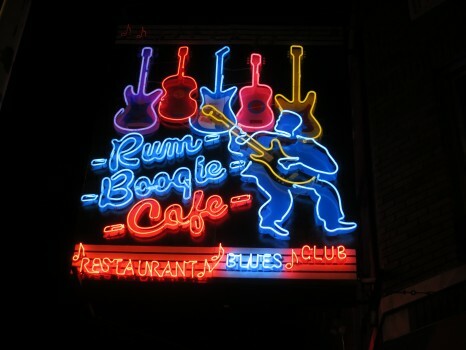 Another place along Beale Street that I absolutely loved was the Run Boogie Café. Aside from awesome décor it had one of the best blues acts I’ve seen in my life. Brandon Santini and his band rocked the joint and I loved every second of his awesome harmonica and the bands great guitar and bass work behind him. It was a great time and a great night. After that day and especially after some beers and blues on Beale Street, you’ll be ready to crash as I was. Sadly I only had 24 hours in Memphis but I was pretty happy with my visit. 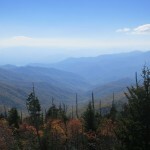 In fact, I cannot wait to go back and do it all again. 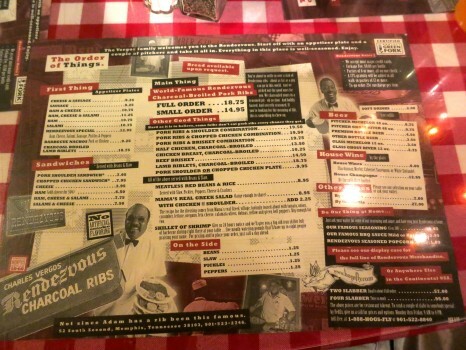 Fried chicken, ribs, brisket and blues…what else could a man ask for?! That fried chicken and those ribs looks amazing! Ya makes me want to go back! I’ve never even thought about going to memphis but I want to go ASAP. Are you working for Memphis Tourism?! If not, they should hire you. Haha no but I am always open to offers….just a great city that I loved. It was a pleasant surprise. Agreed but we actually saw Marc Gasol outside the Fedex Forum leaving practice…was pretty cool…guys like 7 feet tall, can’t miss him! Rendezvous does have amazing BBQ. I spent a summer in memphis when I was younger working at the Hard Rock Cafe, I know don’t judge, but I loved heading there for ribs! You have made me very hungry and I still have 5 hours til dinner! I hope you got to eat Jessica! I don’t like starving people! Upon my return trip, I do want to visit the Civil Rights Museum. That looks like something every American needs to see. 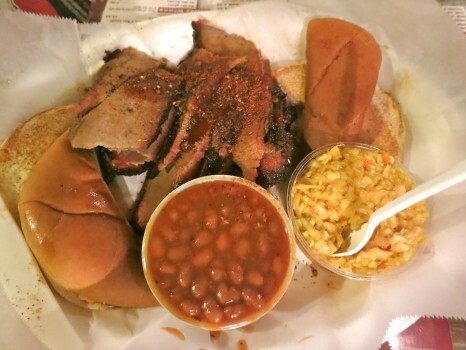 The BBQ in Texas isn’t bad either…looking forward to having some in a few weeks! Thanks and I hope you get back soon! Great article, as always, Lee. One thing – In your paragraph underneath the “Rum Boogie” picture you have it spelled “Run” Boogie. Not trying to be picky, but just wanted to point it out so you can correct. Glad you made it safely to Kuala Lumpur, can’t wait to hear about it! ok the fried chicken & bbq make me miss home right now!! i think i’d like to go to Memphis someday. 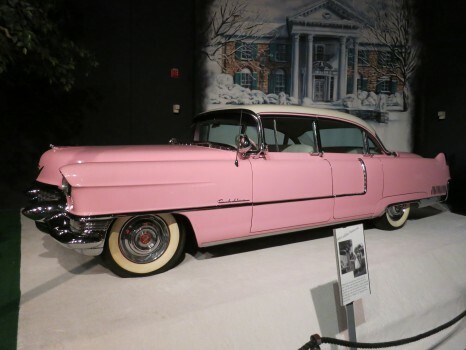 i may not be allowed back afterward, however, when i steal Elvis’s pink caddy! Thank you – I’m going to trust you and give this a go !